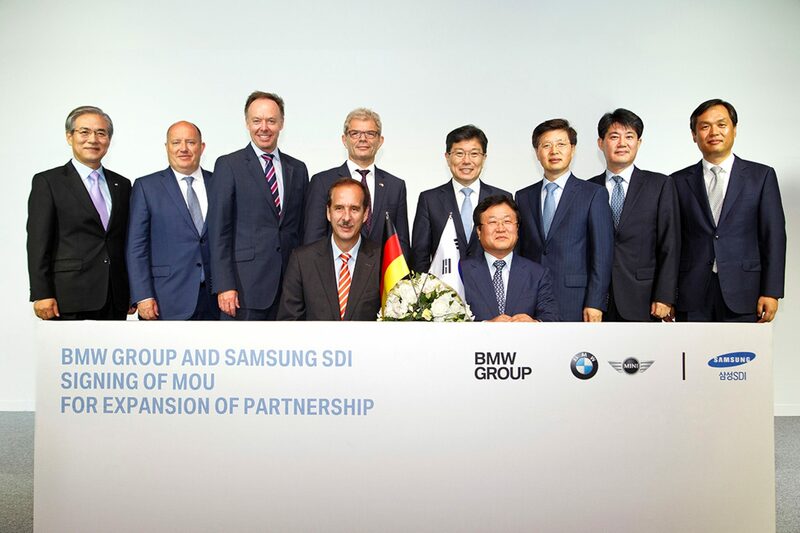 BMW Group and Samsung SDI signed a memorandum of understanding in Seoul on Monday that ensures the future of the automaker’s i Series well into the future by increasing purchases of SDI’s battery cells. SDI supplies BMW with the battery cells used in the production of the i3 EV and i8 hybrid sportscar, and plans for future hybrid models will also hinge on the expansion of the five-year partnership. Because there’s expertise, there’s battery expertise, there’s Korean battery expertise, and then there’s future-oriented Korean battery expertise. If you’re not getting all of the adjectives, you’re not getting the best product. Samsung SDI, the supplier for batteries used in Apple products, has been stepping up its effort to get involved in the automotive industry of late. Recently, the battery manufacturer teamed with Ford to conduct research on a dual-battery system and an ultra-lightweight lithium-ion battery that could render lead-acid batteries obsolete. The MoU between BMW Group and Samsung SDI will see billions of Euros being spent by BMW over the next several years and could help pave the way for SDI to get their lithium-ion batteries into more cars from more automakers, leading to better and cleaner options for consumers in the future. That’s a win-win-win.